John Wick 2 is currently shooting. And today, we have the first photos of Keanu Reeves on set. He returns as the deadly assassin in this highly-anticipated sequel. And from the looks of things, the bad guys still aren't going to catch a break this second time around. These first images come from an eagle-eyed Twitter user, as production is carried out on location in and around New York City. John Wick arrived in 2014, and wasn't a blockbuster hit. It only earned $43 million off a $20 million budget, with a worldwide take of $86 million. But the film was a massive success with genre fans and critics alike. And it has now spawned a multi-media franchise. As you can see in the photos, Keanu Reeves is back in top physical form as formally-retired professional killer John Wick. Also returning from the first movie this time around are Lance Reddick, Ian McShane and John Leguizamo, who help make up this universe of hired hit man living in an underworld of crime bosses and assassins. Judging from the leaked set photos, John Wick 2 is going to carry the same aesthetic as the first chapter in this saga. 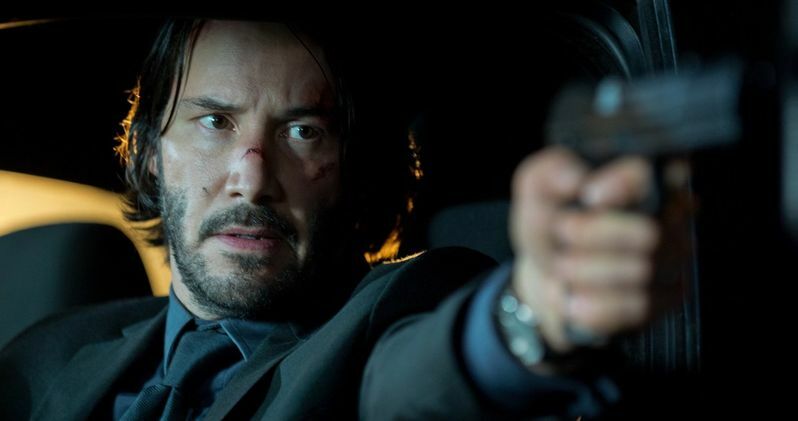 Chad Stahelski, who directed the original John Wick with David Leitch, is returning to take the helm on John Wick 2, though he is going solo this time. Both filmmakers had planned to return, but decided to split up, with David Leitch directing The Coldest City, starring Charlize Theron. John Wick writer Derek Kolstad returned to write the sequel script for John Wick 2. Common has signing on to play the new villain, with Ian McShane reprising his role as Winston, the owner of the Hotel Continental. The supporting cast has been rounded out with new actors Ruby Rose, Riccardo Scamarcio and Peter Stormare. They are joined by original John Wick stars John Leguizamo (Aurelio), Bridget Moynahan (Helen), Thomas Sadoski (Jimmy) and Lance Reddick (Charon). Plot details are being kept under wraps, and no details were given about the new characters played by Ruby Rose, Riccardo Scamarcio and Peter Stormare. In the original John Wick, John Leguizamo's Aurelio ran a New York City chop shop, and Bridget Moynahan played John Wick's late wife. Thomas Sadoski played a cop named Jimmy while Lance Reddick portrayed Charon, manager of the Hotel Continental who has an innate ability to anticipate his client's needs. With Bridget Moynahan returning, it seems clear we'll have more flashbacks to John's time with his wife in John Wick 2, and Lance Reddick's return hopefully means we'll learn more about the mysterious Hotel Continental, which caters exclusively to the assassin community. Thomas Sadoski's police officer character Jimmy was part of one of the original's most memorable scenes regarding a "noise complaint" and John Leguizamo's Aurelio helped shed light on John Wick's past, and how he is not the right person to mess with.